Alvaneu Bad 3 km from Tiefencastel: 2-family house "Deli", 927 m a.s.l., detached, surrounded by trees. On the outskirts, 50 m from the centre, in a quiet, sunny position on a slope, along the wooded area. For shared use: well-kept garden, lawn for sunbathing. In the house: washing machine, tumble dryer (for shared use). 100 m long steep, narrow motor access to the grounds. Width of access road: 240 cm. Parking (for 3 cars) at the house. 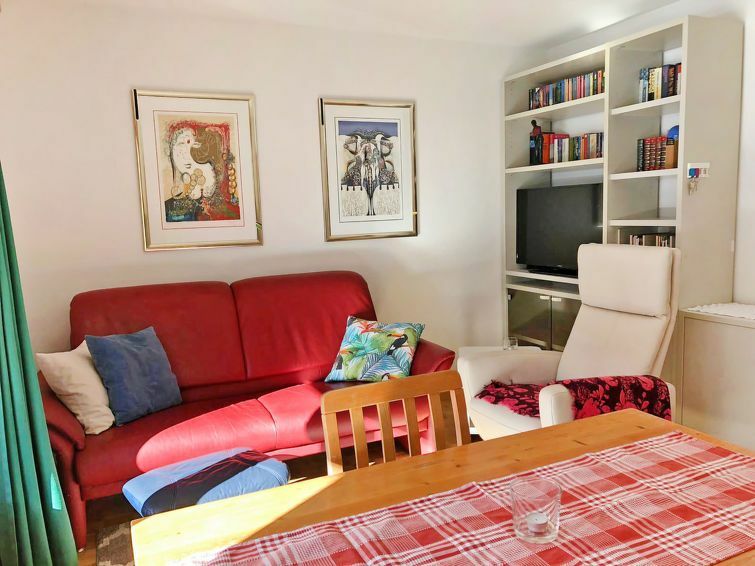 Grocery 3 km, restaurant, bus stop 50 m, outdoor swimming pool 7 km, indoor swimming pool 3 km, thermal baths "Bad Alvaneu" 500 m. Golf course 100 m, walking paths from the house 5 m, cross country ski track 100 m. Nearby attractions: Bergün 11 km, Chur 33 km. Well-known ski regions can easily be reached: Lenzerheide 15 km, Savognin 15 km, Davos 29 km. Please note: car recommended. The owner lives in the same residence. The owner has a dog. 2-room apartment 35 m2, on the ground floor. Tasteful and cosy furnishings: living/dining room with satellite TV (flat screen), radio and hi-fi system. Exit to the patio. 1 room with 1 french bed (160 cm). Open kitchen (oven, 4 ceramic glass hob hotplates, electric coffee machine). Shower/WC. Patio roofed. Terrace furniture, deck chairs (1). Beautiful view of the mountains and the countryside. Facilities: hair dryer. Internet (WiFi, free). Please note: non-smokers only. Maximum 1 pet/ dog allowed.